hope you're feeling better after your accident Dave ... thx for chiming in !! Four quadrant multiplier. Thats funny Dave got this idea too.. Remember a few week ago when we where chatting on facebook? 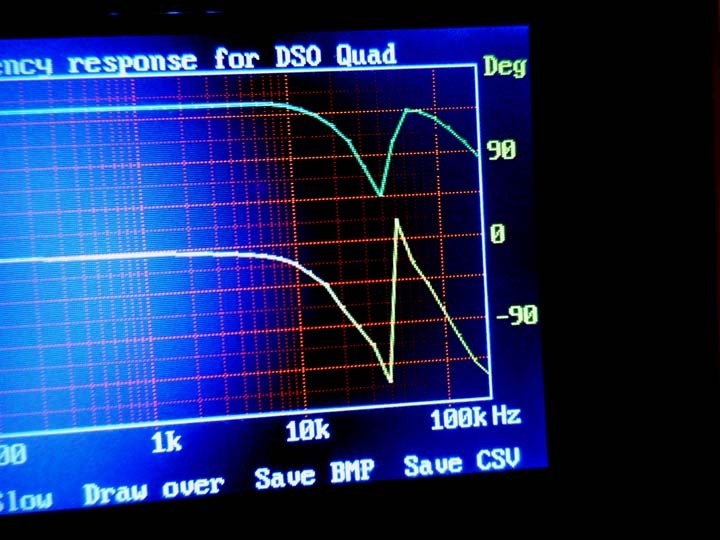 i talked about using quadrature IQ signal to do SSB modulation(frequency shift)? exactly what i was thinking about. for the forum reader(frequency shift = continuous phase shifting..). 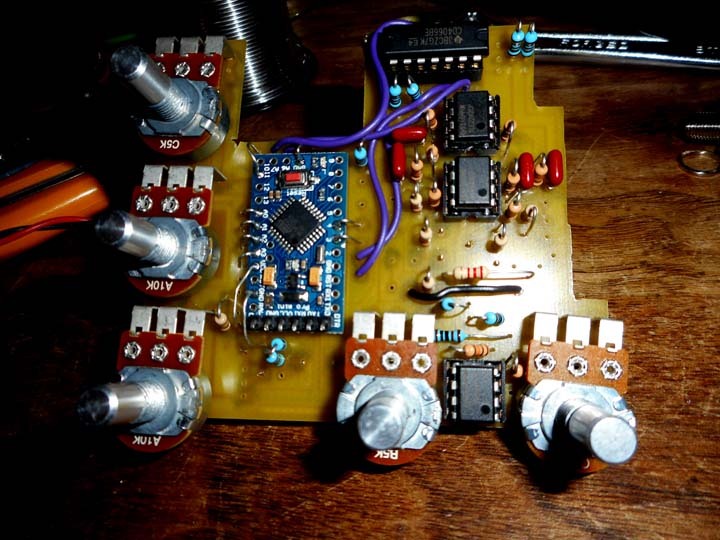 Then you add or substract the signals output from the mixers for upper sideband or lower sideband selection(frequency shift up or down). But i also dropped the idea because those mixer are fast, and since we drive em with low frequency squarewave clock(this give me a bad feeling)...(i think, but i could be totallly wrong there) I still beleave it could work as-is, i just don't feel comfortable with it..
Or we could use integrators for a trianglewave quadrature clock? 1002hz + 2hz = 1004hz. same result just different way to get there. 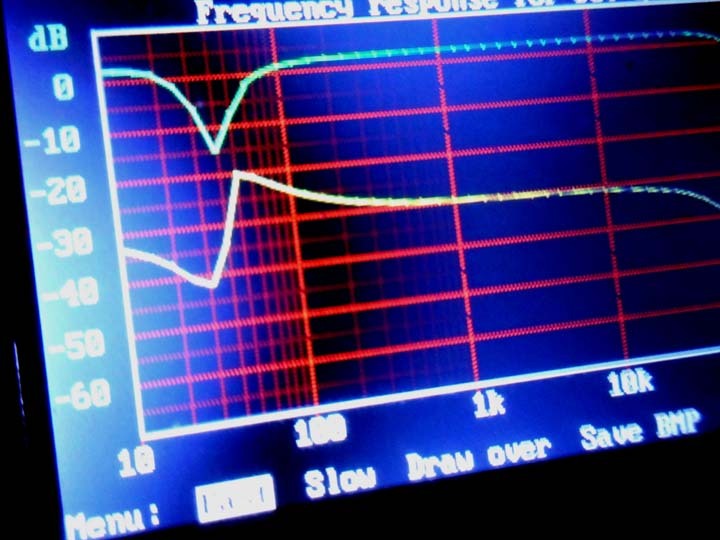 But then we could also simply move away from the squarewave uC oscillator. Then use one variable frequency LFO with sinewave output. We just need to split it's output by 90 degree again using lattice or all pass filter(for the quadrature clock). We then have the same 2 option, multiple clock divided by 2 for each channel(using mixers i guess? ), or re-use the last stage audio signal that is frequency shifted and run it through the lattice/all pass filter then quadrature modulate(frequency shift) it again. Then we have a 100% analog solution. with 1 oscillator and many channels. All we need is 1 extra lattice and 1 extra quadrature modulator for each additional channel. Bam.. i love myself loll. Phew i hope all this make some sense? No, I don't think it's stupid at all. 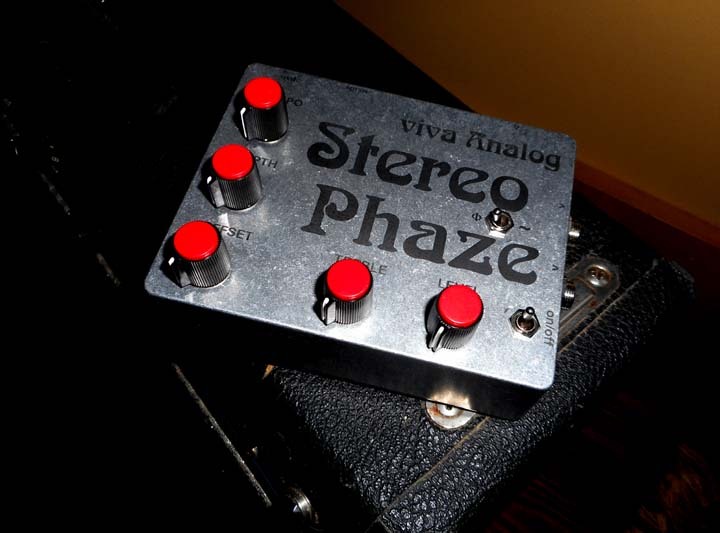 It is very "analog synth" like in conception. It seems entirely possible to me to use integration to get the wave structure you need, and cheap too. Remember that synths used all kinds of waves to get various envelopes from the four quadrant multipliers. Square wave to pseudo-sine with two components. The old idea from the first divider organs; get as many frequencies as you need from one clock, if you start with a high frequency clock you can have a lot, and all tunable with one component, in the organs usually a slug in a coil. There are a lot of possibilities still in the analog realm worth thinking about. My friend Bob Hovland, the engineer at VOX, always wondered why Wayne didn't use 90 deg phase shift implementations in his design. Brad Plunkett, Bob's boss at VOX, actually did in his version of the frequency shifter. BTW I loved the typo!!! I just checked out the amp link you posted. Such a very sweet remembrance. I hope they give me something like that. Can you share anything about his amp design? I don't mean to get repetitive, but if you get the time, please check out the transfer curves for the depletion mode mosfet LND150. Those curves look an awfully lot like a triode (even though the output characteristic looks like a perfect pentode), with a very nice ramp to complete cutoff of -20 volts. Between 0 and -2 volts on the gate you get a drain current of 5ma down to milliamps, and as you go more negative, down to microamps before complete cutoff. It cuts off faster than a triode, but there is still room to get a smooth turn on before the drain current slope gets much steeper. This is a Supertex product, with a 500 volt rating, so it can be operated exactly like a tube, with negative bias, also meaning local feedback of the inverse current variety for further linearity. It looks to me that this may solve (with a little work) the transfer of the Wayne idea to the SS realm, and save you a thousand parts. Gar Gillies was a great man, he is best known for creating the American Woman tone that the Guess Who had // the Herzog was the name of the unit used there, simply a modded high-gain Champ variation ... he was the maker of Garnet amplifiers, one of two major Canadian amplifier brands, the other was Traynor ... when I was growing up Garnet and Traynor amps were regarded as "practice" amps and you stepped up to a Marshall when you were ready ... though, a couple of exceptions come to mind: Pete Traynor's Custom Special and his mega huge Super Custom Special (the loudest production tube amp at the time, which some say made Ampeg come out with the SVT) and the Garnet "BTO" , Gar's answer to the SL100 ... to me Garnet BTO is the Kodyak bear of 100 watt heads, sounds more agressive and balsy than a Marshall ... quite an amazing piece // Gar told me that a little over a hundred of those were made ... the Herzog is still being made in Winnipeg by Pete Thiesen (with Gar's permission) ... Pete sent me the last amp that Gar was working on, thinking I was the guy to complete it // ... I spent a few years thinking about how best to celebrate Gar's legacy in this design but had to put it aside due to work, homelessness and a couple of motorcycle accidents since and have only recently started looking at it again ... the main problem there is deciding what to alter and not (out of respect) // Gar had the power supply and output stage all wired up ... by the time Gar stopped making amplifiers he'd been trying to emulate what Mesa was doing with their 1x12 high-gain designs in a model called the Enforcer ... but I didn't want to go that obvious route, instead I decided to make use of Gar's most famous design and find a way to incorporate it into this chassis ... in the process the amp will have a very cool "option" not seen in any other tube amp // I'm still working on the logistics, which I'm afraid must involve cad drawing the chassis as it is now and sizing parts, etc ... yup, it's a party!! Wow, nice post! Full of ideas and hurdles. If I am not mistaken, what you are looking at in the mosfet is how much signal you can input at the source without clipping the top of the waveform off. One thing you would need to look at is the effect of inverse feedback at the source/cathode. Since the biasing resistor tends to work opposite of the signal on the inverting node, the amount of signal which can be applied at the gate is increased, and the voltage swing on the source/cathode is also increased. This has the effect of raising the amount of voltage which can be superimposed on the non-inverting node. What I have observed say on the 12AU7, is that it takes about 10 volts to shut the thing off, and by that time, the distortion in the gated signal caused from being larger in amplitude than the bias voltage is essentially inaudible. So there is a little roughness at the lowest levels of transconductance, something you wouldn't get with a lamp and photocell, but something which is not very important either. It looks to me like you could get maybe 5 volts of swing with the mosfet using a similar sized source resistor, but that would have to be calculated by the transconductance of the chip, which is probably higher than the tube. so it might be easier for you to find. So from his experience I take it that we would be in the ballpark with the mosfet. It boils down to the fact that a longer ramp to cutoff means less matching, and more dynamic range. All we really need is that the gated signals don't "pop" on, and that we have a reasonably stable amplitude between the three gated signals. As far as frequency shifting goes, I have gotten some range change by changing resistors, probably enough to satisfy the needs of the musical world. Listening to speeds above 8HZ seems to get more experimental and less musically useful for "songs". I just don't know how important frequency changing is with such a complex signal to begin with. Switching a few caps, which is a pretty simple procedure, could work much better now than in Wayne's day because of the incredible size reduction for those larger values, that is if one really needed that option. I'd love to see the comparison in parts count and complexity between these various ideas. I know from experience that everyone was trying to get into the frequency shifter game by 1970, but that SS devices were the only allowable option because of cost and complexity. Tubes were out forever according to the engineers, as they went about their illusory challenge to replace them in every application. That's why Wayne went to optical, and every other device/engineer I saw back then except for Don Foster's "The Foster Freqy" a unit I worked on with him before he died which translated the signal into RF and did the modulations there. It was however SS. 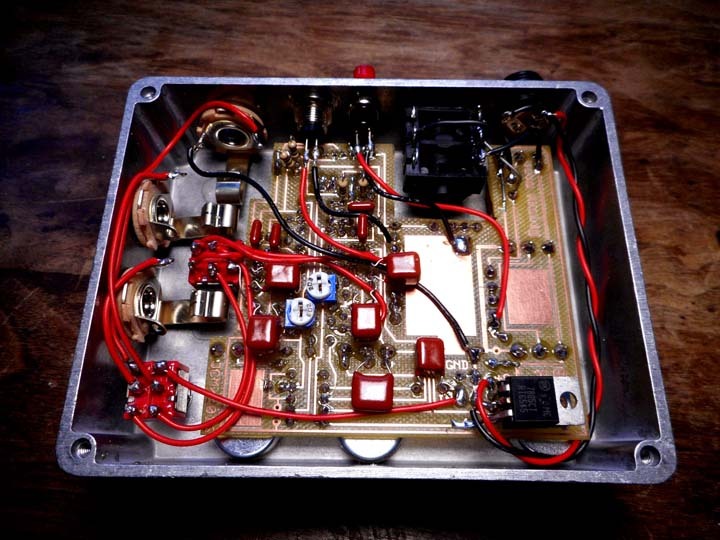 According to Bob Hovland, the closest thing to a tube we have in the SS world is that mosfet. I'd love to try it myself but have no time. We did alot of progress latelly. No more matching needed. No more opto-coupler, no mosfet transistor . I will let JC explain the technical detail when its ready. Still some testing to do but i think we are real close. ... which otherwise worked fine ! Long life to this very cool super Advanced project ! thanks for sharing all this development. Selling some prepared kits with a well deserved commission for you, Dave and Tek on some group buys could help you perhaps ? cool view of your lab ! Last edited by Eb7+9 on Sat Jan 21, 2017 5:05 am, edited 2 times in total. Oh nice, i just discovered Dave's youtube channel, its great . Wondering what is the value of the capacitor under the pcb thats in parallel with the .01u ?? The PWM wah look very interesting, it pick up my attention. The OTA version of the CTP look promising. I really need to move to a bigger/faster chip for more channel(at that point i could do 4 channel or more with 1 chip). Its not a big deal for me to "migrate" the code to another chip. There is 2 area of the code where i see improvement can be done too, i could do that at once. am not gonna lie, its gonna be a little bit of work but i bet the result will be outstanding and well worth it with all the work that JC do. I did the PWM-wah code at my cottage on my touch screen cell phone in about 3 hour(that include time to eat my diner)?...And i feel like i could have done it in 30 minute only. loll. thanks a lot for your dedication and attention to detail ! love it ! great sound ! !